Nobody is happier that I made these pound cakes than my boyfriend. Not because he’s the biggest lover of pound cake per se – though, being a sweets monster, I’m sure he wouldn’t turn down a slice or twelve – but because he likes things clean and organized, and most of the ingredients for this pound cake (except for the obvious refrigeratorables) have been out on the counter for almost a week, in anticipation. But then, my hand mixer died. And then I went to Boston for a few days. And then I had to write and organize our house, making it clearly impossible for me to also make pound cake that day. But yesterday, a new mixer was purchased. And today…today. 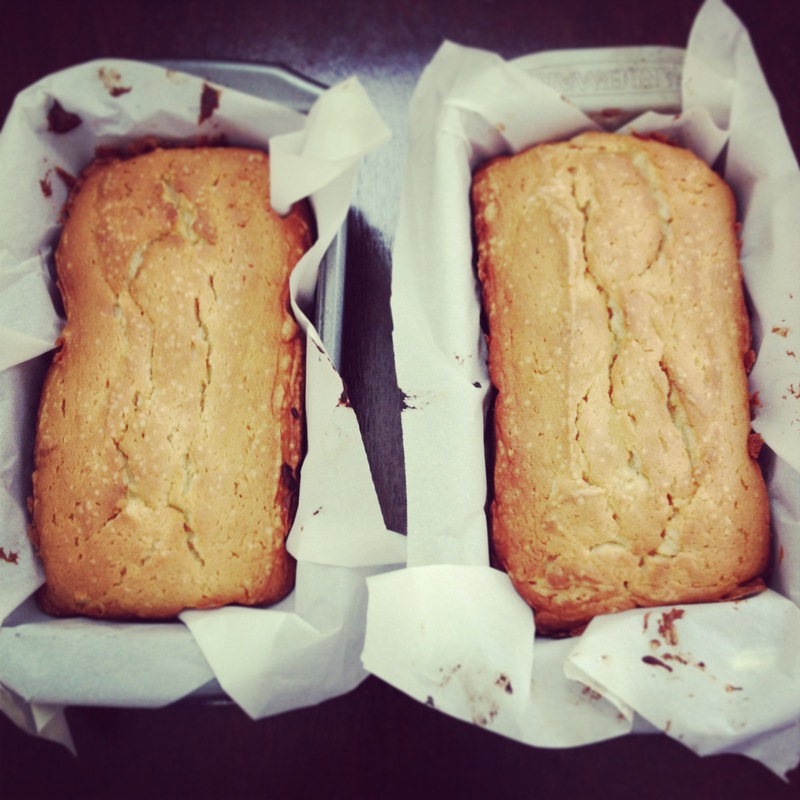 Pound cake was made. 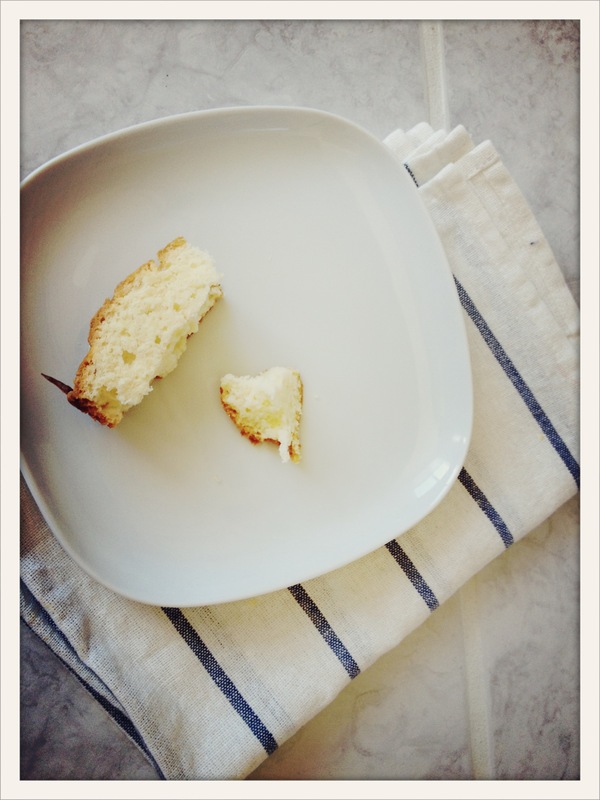 And lo, that pound cake was amazing. This recipe comes via Molly Wizenberg at Orangette, one of the loveliest food blogs out there. Sometimes I am intimidated to try her recipes because they seem to require a level of skill beyond my repertoire, but when Molly says something is exceptional and you also happen to have a weird amount of cream cheese in the fridge, you just try it on. After a whole lotta mixing and a little bit of skepticism (I sincerely doubt Molly Wizenberg’s cakes looked at all like mine in all their crumply rumplyness) we have a dense, chewy pound cake on the counter for eating, and another one in the freezer, ready to be thawed, sliced and topped with lemon ice cream at a dinner party. It would also tasted exceptional topped with a spoonful of this. If that’s not something to try on, I don’t know what is. 1.Preheat the oven to 325°F. Grease and flour two 9-by-5-inch loaf pans. 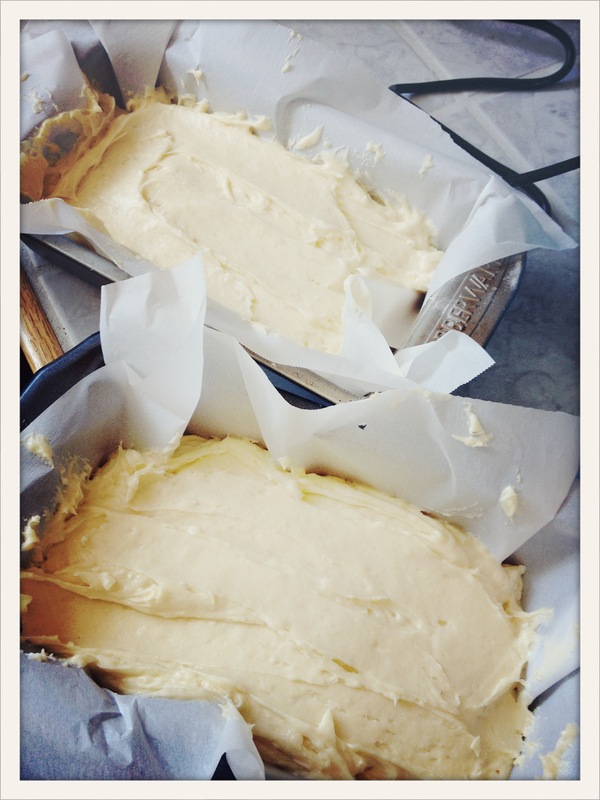 I used coconut baking spray, for the teeniest, tiniest hint of coconut, then floured and lined with parchment. 2. In a medium bowl, whisk together the flour, baking powder, and salt. 3. 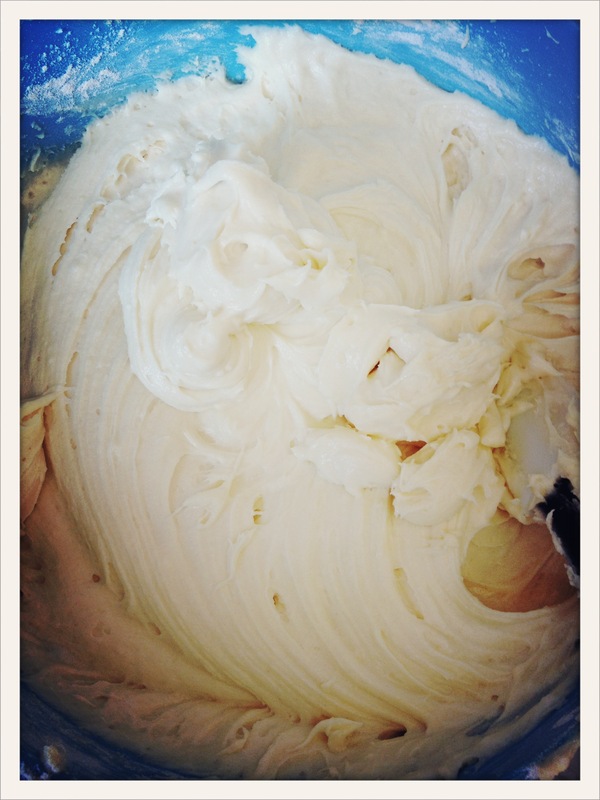 In another bowl, combine the butter and cream cheese and beat on low until fully creamed together. Add the sugar one cup at a time, then beat for two minutes more. Stop to scrape down the bowl when needed. 4. Add eggs one at a time, beating well after each egg to make sure they’re all fully incorporated. 5. Finally, add in the flour, a cup or so at a time, and beat until fully incorporated. 6. Plop the mixture into prepared pans and spread it out. It would be nice to say “pour into pans” or “spoon gently into pans” but I was, most definitely, plopping and spreading. Kitchen life isn’t all glitz and glam you know. 7. Bake until the top is golden brown and an inserted toothpick comes out clean. The recommend times range from 55 minutes to an hour and 15 minutes. Mine took about an hour and 5 minutes. Just watch ’em! 8. Let the cakes cool completely in their pans. You can transfer to a wire rack, but I just left them in their pans for a few hours and then transferred them straight to the fridge and freezer respectively. 9. Serve to people you love. Like yourself! Because frankly, if you love yourself enough to allow for the midday pleasure of iced coffee, a few bites of pound cake, and a meditative glance out the kitchen window, then you are my kind of person. London has some big events coming up: the birth of the Royal Fetus, the summer celebrations in honor of the queen’s birthday, because apparently the queen just gets to celebrate her birthday whenever she damn well pleases and call it a fancy name, and my impending arrival! Yes, all of Britain is eager to see me. Or maybe I’m just eager to see it… Either way, I’m lucky to be headed across the pond in just a few weeks.
. Having an Audience with the queen!
. Strolling around on a foggy morning, steaming cup of builders tea in hand! 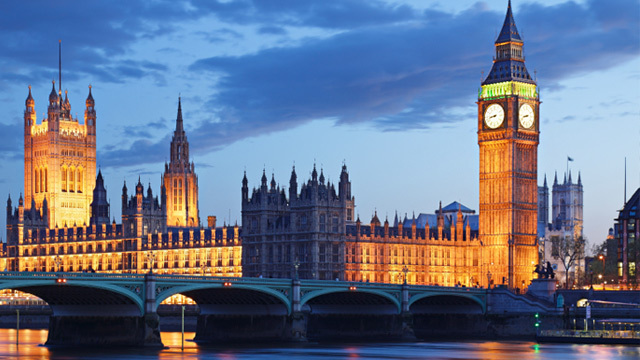 What are your London must-see and must-do activities? I’d love to know! Is this the best quality? Will it be dated next season or will it always be on-trend? Does it look fabulous on me? If the answer isn’t yes to all of the above, I don’t purchase. Instead of buying, I am finally curating, applying thought and effort into what comes into my closet. Already, this has saved me from several sartorial near-disasters: cat loafers (cute, but overly trendy. Also, I’m not a Japanese teenage girl, so it’s questionable whether or not I could have pulled these off anyway), bensimon sneakers in a bright coral (do I want them because I love them or do I only want them because they’re French? “Because it’s French!” is actually a reason I do way too many things) and yet another cheap scarf (or twelve) while abroad. This new way of curating has also led to a series of purchases I couldn’t be more excited about: a beautiful, petite pebbled leather cross body bag from Calvin Klein. A small but sturdy umbrella in a classic red. And a fitted black blazer with a whimsical, yet subtle, polka dot lining. I smile every time I turn up the cuffs. And…that’s it. The euphoric highs of finding a bargain, and the accompanying lows when cheap clothing falls apart and I hate everything I own, are slowly being replaced with the knowledge that I will always look polished when I have the right foundations: a classic trench coat, beautifully tailored black pants, dark skinny jeans, ballet flats with a hint of shine, a soft, sky blue pashmina. There are so many blogs that encourage, subtly or not, the idea that we should always be shopping, buying, consuming and replacing. Not only is this a waste of money, time, and resources, but ultimately, most of us don’t really look that great in the crap that we buy (myself most firmly included). 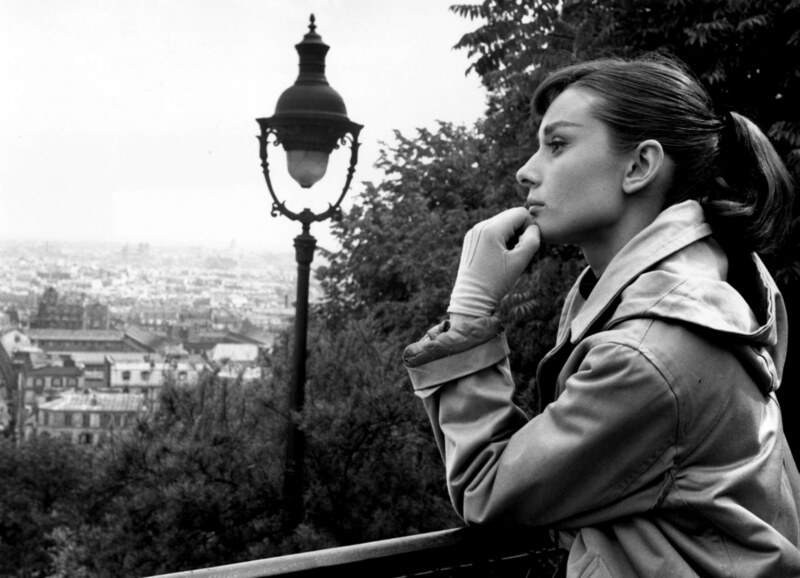 What do you consider a “classic” item that you have to have in your closet? I’d love to know! 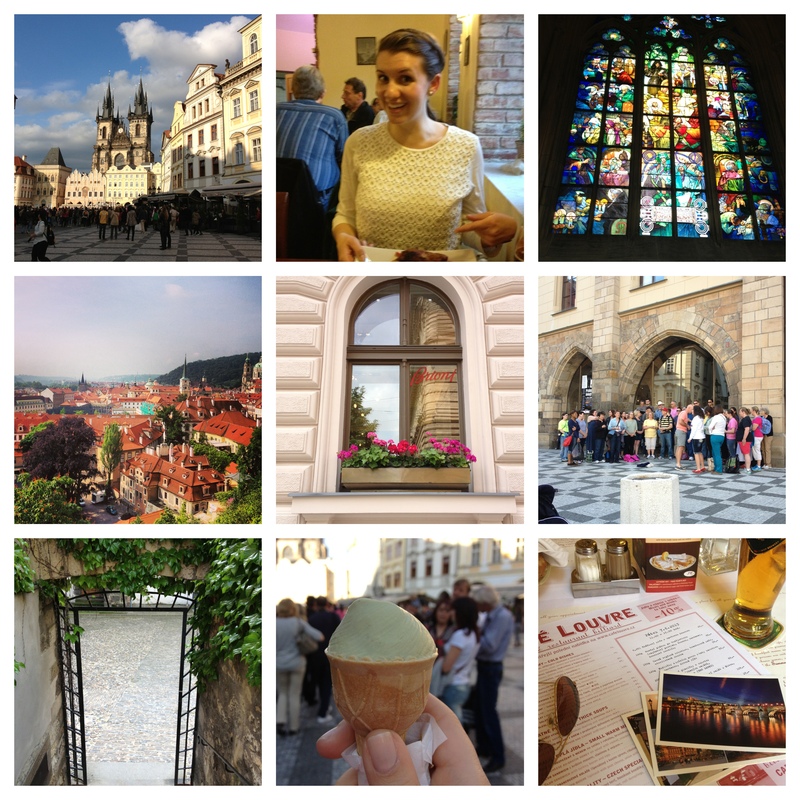 Now that I’m back and rested up from Prague (let’s be real – I’ve been home for two weeks. It’s the resting part that takes awhile since I require sleep equivalent to that of a sloth) I thought it would be fun to share a few pictures. Travel, for me, is not only the chance to see a new country but also the chance to try on a new life. At home in San Francisco I eat primarily vegetarian, with the occasional fish or shrimp. In Prague, I ate barbecue pork ribs, a whole rack of ’em. And here’s the thing – the pork ribs were actually delicious. Did I feel awful afterward, both morally and…gastroenterologically? Definitely. But not as awful as I would have felt had I used my Czech friend and her incredible generosity to cause a fuss and make some sort of vegan scene in the little Czech pub owned by her friend, where we were drinking at our leisure in the back garden, and where we were having one of those great, up all night, we are now friends for life kind of conversations that can only happen when you travel. 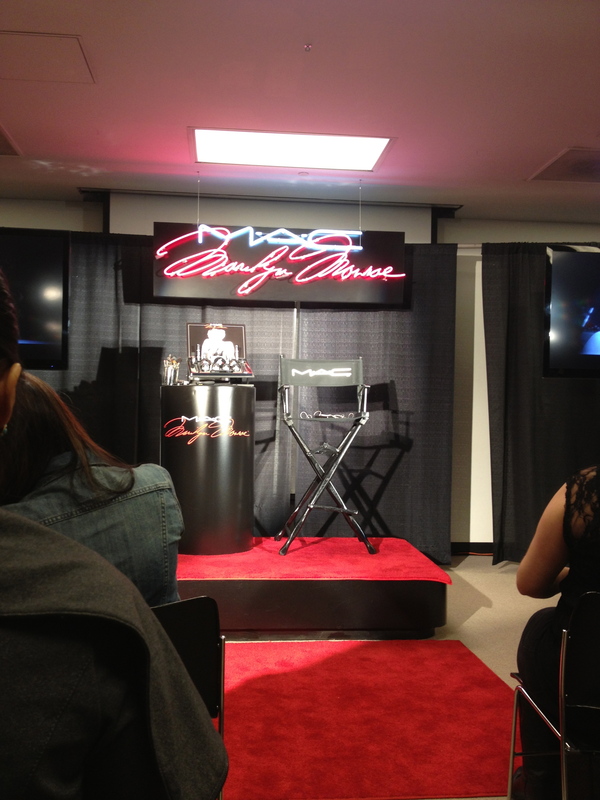 A few weeks ago, I was fortunate enough to take a master class with MAC Cosmetics director of makeup artistry, Gregory Arlt. Not only is Gregory rather hilarious and full of one-liners, but I was able to pick up some great tips and tricks for mah face. This is especially great since, if you know me, you know that my face area is typically treated to tinted moisturizer, cherry chapstick and a swipe of whatever drugstore mascara I am recently enamored with due to promises that said mascara will make my eyelashes look like delicate spiders or diamond-encrusted fairy wings or the eyelashes of someone – anyone! – with more awesome eyelashes than the ones I have. I essentially have the eyelashes of a wombat fresh out of hibernation (do wombats hibernate? What even is a wombat? * Things to google…) so I am especially susceptible to the bold claims** of the mascara industry. 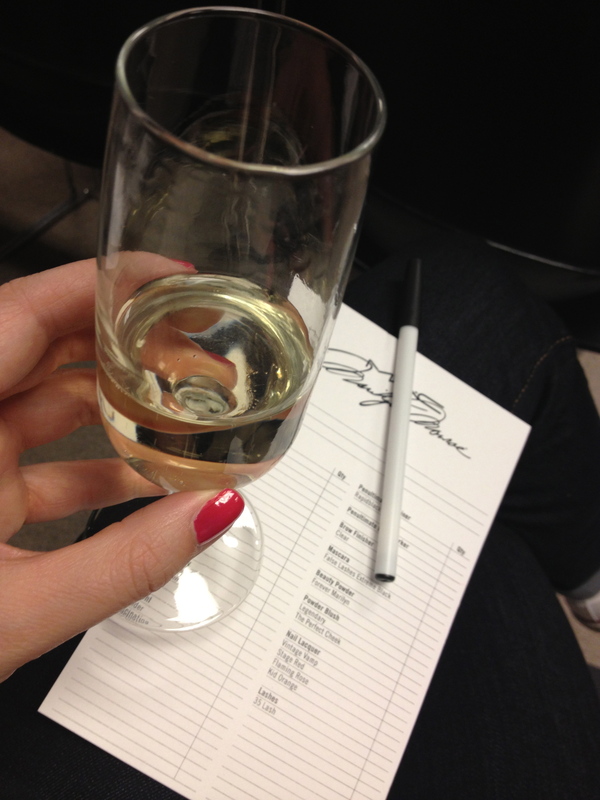 I am also susceptible to champagne at industry events and trainings. See? Let’s move away from my wombat face long enough to discuss a couple of Gregory’s best tips, shall we? 1. Skin is canvas, prep accordingly. My skin is nearly as white as a canvas, so this really resonated. MAC Prep + Prime in Radiant Rose banishes the look of jet lag in about two seconds, and helps foundation and concealer stay on longer and better. No one is paying me to say this – I just paid to purchase it. It’s that good. I tested it out on my recent trip to Prague and my coworker exclaimed (really, she actually exclaimed) that I looked incredibly fresh and well-rested for having taken such a long flight. Joke is on everyone because I slept zero and felt like death. Ah, the magic of makeup. 2. Eyeshadow is best applied with the eyes open, like a queen looking down on her subjects. Not only do I love anything associated with royalty, but this makes so much sense. Why do we apply makeup to look awesome whilst our eyes are closed, if we’re going to run around all day with them open? Who here is Sleeping Beauty? No one? Yeah, me neither. 3. Always travel with black eyeliner. Especially because there is a strong likelihood it will travel anyway. Down your face. Reapply often! Enough said. What are your best makeup tips or tricks? *I have no intention of finding out what a wombat is, it’s just a hilarious word. When writing things that are funny, the more funny words you incorporate, the better. Say it with me now…WOM BAT. **Bold claims. Also known as lies, sweet Don Draper advertising lies.